An investigation into how the New Champlain Bridge is being built for only very light railway axle loads, and how this would make it difficult to build an integrated regional rail system shared between REM, AMT and VIA, but not impossible. One issue regarding the REM light metro project that has come up during the BAPE hearings, and that has come up in the news several times, is the one of sharing the Mont-Royal tunnel. 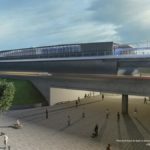 The Caisse intends to privatize the tunnel and monopolize it, although the Mascouche and St-Jerome line of the AMT, and VIA rail need to access it. VIA rail needs access the tunnel for its proposed high frequency train between Quebec City and Montreal – the routing via the North Shore and Trois-Riviere is 45 minutes faster, and has more population along the way. The refusal of the Caisse to design a shared system between the REM, VIA and the AMT is probably the main issue, which also informs most of the concerns related to privatization. One of the issues for for a compatible system is the change of the electrification from 25KV to 1.5KV. The former is usually used on mainlines and on regional and commuter rail systems, the latter on metro systems. 25KV provides more power, and due to the higher voltage there are less resistive losses. This means substations, the equipment buildings along the line that feed electricity into it, can be further apart. Fewer substations is great for a system involving large distances. So most long distance, regional and commuter rail systems use or will use 25Kv electrification (including VIA). However, 25kv electrification also requires heavier transformers on the trains that convert the power to be used by the motors, so the trains were historically heavier. The Deux-Montagnes line was actually converted in the 90s from 1.5KV to 25kv, and new, more powerful trains were ordered, the MR-90 railcars. Back then, this project cost 300M$. We are now reverting the electrification back, although we don’t know the expense for that. 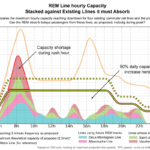 When I asked the REM people about the reason for changing the electrification, they told me that “1.5KV is more appropriate for a light rail system”, and that trains using it are lighter. They also told me that the weight of the trains is a big concern, due to the low allowed axle weights on the Champlain bridge, which is built to light rail standards. They said you that you couldn’t just extend the existing Deux-Montagnes line with its MR-90 vehicles onto the Champlain bridge because they are too heavy. This seems strange. We’re building a new rail bridge that’s still under construction; and there are already weight concerns? I decided to investigate the issue. What are the exact weight requirements on the Champlain bridge? I e-mailed the New Champlain Bridge to ask about rail axle weights. They forwarded my request to Infrastructure Canada, which pointed me to the Project Agreement between the Canadian Government and the “Signature on the Saint Lawrence Group”, a consortium of SNC-Lavalin and others to build the Champlain bridge. For the SLR phase (as defined in Section 4.1.1 herein) the live loads shall be taken as rail traffic in accordance with EN 1991-2: Eurocode 1- Actions on structures – Part 2: Traffic loads on bridges. Section 6 of the Eurocode together with the Project-specific application rules contained in this Agreement shall be considered applicable for SLR loading. The structure shall be verified for both Load Model 71 and Load Model SW/0. Classified vertical loads shall be applied. The factor alpha referred to in Clause 6.3.2 (3) of the Eurocode shall be taken as 0.50 and shall be applied to both load models except that the classified value of the axle load Qvk to be used in Load Model 71 shall be taken as 146 kN. This sounds good! The railway is defined according to a standard, a European one on top of that! They know how to build trains, right? But we still don’t really know what the actual weight requirement is. So the search continues, now for what this “EN 1991-2” specification is, what the “Load Model 71” and “Load Model SW/0” are, and how those alpha and QvK values fit into that. This basically explains that a train is allowed where four following axles may all be at least 1.6m apart, and each may apply a force of 250kN (25.4T) to the track. These correspond to the bogies (trucks) of two adjacent railcars, which each hold two axles. Beyond that, the train is allowed to apply 80kN (8.2T) per metre. The text of the specification also explains the value alpha. It allows scaling the model to deal with different kind of traffic. For example, A factor of 1.3 would allow traffic that is 30% heavier than the figure, for heavy freight, a factor of 0.75 would allow traffic that is 25% lighter than the figure, for example light electric multiple unit trains. One interesting bit about this is that an ‘alpha’ value of 0.5 is outside of the spec of EN 1991-2, which allows a minimum value of 0.75. This results in minimum weights that are outside of any European track norm. The Champlain bridge allows only 14.9T per axle and 4.1T per metre. The lightest track that exists in Europe, the nowadays only seldom used track class A, allows 16.0T per axle and 5.0T per metre. It seems odd that the Champlain Bridge was specified using a load model following a standard specification, but then overrides values to be outside that spec. What is the Axle weight of the current vehicles used on the Deux-Montagnes line? The MR-90 vehicles used on the Deux-Montagnes train consist of motor and trailer cars. The motor cars weigh 57T, the trailer cars weight 44T. The railcars are 25m long. Given that there are four axles per railcar, this gives a weight of 14.25T per axle and 2.28T per metre for the motor car. Good news, that’s (barely) within spec! When I pointed this out to one of the technical directors of the REM, he was actually pretty surprised. But there’s a problem: we also have to add passengers. It’s an ancient wisdom in railroading that everything would be much easier without passengers. This means the axle weights of the vehicles are 22% too heavy, without any padding. Therefore, the MR-90 vehicles of the Deux-Montagnes line can not go on the new Champlain Bridge. Anything that has a locomotive in front or bilevel-rail cars is so heavy that it will never be able to go on the Champlain bridge. So forget your phantasy maps drawing high speed rail lines across the bridge to the United States. Why did we design the bridge for such a light standard? We have to remember that it’s been decades that we’ve been talking about putting a light rail system on the Champlain Bridge. The plan kept changing back and forth, sometimes there was talk of a metro, sometimes of expanding the busway, usually the goal was a ‘light rail’ solution. This usually assumed a very light rail system, something like a tram, sometimes maybe like the Vancouver skytrain. 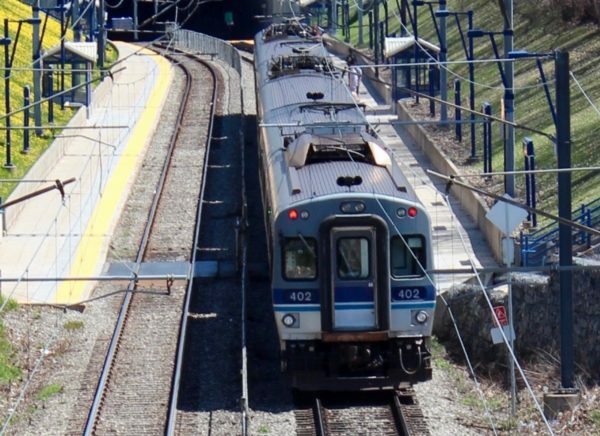 It’s only with the Caisse’s REM plan, first announced in April of 2016, that there was any official plan to connect the heavy rail Mont-Royal tunnel and the Champlain bridge light rail. One transportation official of Montreal I talked to called the idea of connecting the Deux-Montagnes line and the Champlain bridge corridor “genius”. I would not be so generous. I would call it necessary. The Champlain bridge LRT always had the problem of access to downtown. Previous plans assumed some sort of aerial station south of the downtown, always with the problem that a direct access to downtown and connections to the metro would be very expensive. Later plans called for a streetcar going downtown via Peel street, which would have the problem of very long trams frequently piling into dense downtown. Making the connection into Gare Centrale is an ideal solution. There’s a right of way leading into the station from the South, and another line that continues North. There’s plenty of space, for many rail lines, and the potential for many connections. The idea of connecting the two lines terminating at Gare Centrale, coming from the North and South, then becomes more obvious. The resulting connected line would provide the starting point for a regional network composed of a high-capacity trunk line and many branches in the North and South. In the downtown section, there would be the chance to connect to three metro lines, assuming the construction of extra tunnel stations. All these ideas come together fairly easily if you look at how other cities design transit, for example the several RER lines in Paris. Montreal should’ve always followed those examples. So with these ideas in mind, the Champlain bridge should’ve always been designed with enough flexibility of axle load to create such an interconnected system. Given this constraint it will be difficult to build a shared system. We’d need a vehicle that can both mix with the heavy rail trains used by AMT and VIA, but be light enough to go on the bridge. At this point it’s moot to argue about the planning mistakes of the past, the contract is drawn up and the bridge is under construction. The issue now is whether we can salvage our regional rail system. The main question is whether it is possible to purchase mainline rail vehicles that are light enough for the Champlain bridge, but are nevertheless compatible with heavy rail (and its 25kv electrification). 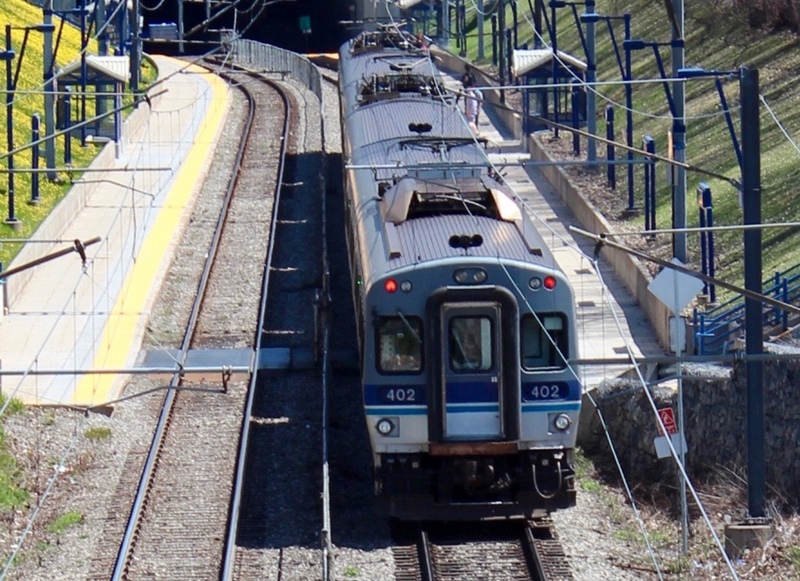 Are there 25kv mainline rail cars that are light enough for the Champlain Bridge? We have to remember that the MR-90 vehicles were built 25 years ago. The vehicles are longer than the ones used on the REM (25m vs 20m), and they were not optimized for weight. In fact, the configuration of motor-car and trailer-car encourages more weight on the motor car: since weight gives you better adhesion, you want as much weight on the motored axles as possible, and as little weight as possible on the deadbeat trailer cars. This way you can maximize the power you can apply to the rails. In the last twenty years, railway technology has improved tremendously, as has the technology of 25kv transformers, which have become much lighter. If you optimize a rail vehicle for weight today, is it possible to make a mainline rail vehicle that is much lighter? There are not too many mainline railcars that that light that they can go on the New Champlain Bridge, but they do exist in places that optimize for weight. In Japan the Shinkansen E6 is a high speed train that weighs only 11.8T per axle, fully loaded (see page 6). The main way they accomplish that is by distributing all equipment evenly along the train, every axle is powered (also, they only have seated passengers, so there are fewer of them overall). Hamburg’s urban rail system (S-Bahn) also has vehicles that are light enough (class 474, class 490). But the most relevant examples are in Britain. There, the weight of vehicles is largely optimized to reduce maintenance costs. The result is that manufacturers build very light trains. Two vehicles are being produced right now to be used on networks that are each composed of a downtown tunnel connected to many branches (sound familiar? ): Thameslink and Crossrail. Both these vehicles show that it is possible to fulfill several constraints of a possible shared system for REM, VIA, and AMT, using existing technology that has already been built. While these vehicles could be used almost directly in shared Mont-Royal tunnel and the New Champlain Bridge, including providing the automation that the Caisse is so keen on, there are regulatory issues when mixing a European-built train with AMTs and VIAs passenger trains built to North American standards. Other agencies have gotten waivers to allow this sort of intermingling, and there are signs that the regulations itself are changing, but this is a big issue that is better explained in another post. Alternatively, it may be possible to utilize the technology that makes new railway vehicles lighter in order to build ones that are compatible with North American Heavy rail standards, although such a custom-built vehicle may be more expensive. What these trains do demonstrate is that it is possible to built lightweight mainline trains using the same electrification as exists today; and that obey the necessary weight limits. This is one of the hurdles to building a shared system has already been overcome. I begin to share your apprehension about the REM project. Could not the TOR of the Champlain bridge project have taken account of probable long-term trends in North American passenger rail transport? It would have cost little at the construction stage to provide higher load capacities. Why did not the TOR of the REM take account of its integration with the existing Montreal networks? Where were the provincial and Municipal governments in the planning process? We are heading towards three independent and unintegrated transport systems serving a fairly minor city. The tragedy is it would have been avoidable with a serious urban transport plan at the provincial level who it appears at present treats transport issues “cas par cas”. Anybody that advocates for billions of dollars in public transportation investment in the red areas is part of the problem. Why not use the Victoria Bridge instead? This is a very interesting point you have brought in your article, Anton. Of course, it’s a shame that the new Champlain Bridge wasn’t designed for heavy rail. But light trains that are compatible with existing heavy rail infrastructures aren’t uncommon in North America. For example, the O-train in Ottawa is a light rail system that is using existing heavy rail infrastructures abandoned by freight rail companies. As you said, the same can be done for the existing infrastructures on the Deux-Montagnes line without having to demolish them by using lighter trains than the old MR-90. I really think you should propose this idea during the BAPE audiences, hoping that the CDPQ will hear it and consider this option before it’s too late, allowing the Mascouche, St-Jerome trains as well as VIA Rail to use the Mount-Royal tunnel. @Stefan: the Victoria Bridge belongs to CN and it’s already heavily used by VIA Rail, Amtrak, the AMT and CN freight trains. First as an independent Transportation Planner in Ottawa, I am glad someone in Montreal has finally grown a brain and has raised many of the same if not even more issues than I did when I first wrote the backers of the REM proposal in the spring. I am convinced more than ever that this was really done to try and sell Bombardier’s Innovia ART 300 Automated Light Metro System, otherwise known as the Vancouver Skytrain/Scarborough RT technology in the Montreal area. Bombardier maybe shelving the technology because it has had so few orders in the last 30+ years. Far too few orders for the modern vehicle transit industry and far too few to be holding open valuable production lines for it. Just for clarification, the O-Train (now called the O-Train Trillium Line) in Ottawa is actually licensed as a commuter rail line by Transport Canada not a an LRT line, we just operate it like a diesel LRT line. The line actually used by the O-Train was sold to the City of Ottawa by the CPR but is still considered an active part of the national railway system. That means legally, LRT technology can’t be used on it due to Transport Canada operating rules. Therefore, the line had to use mainline railway compatible vehicles. Alstom Coradia Lint 41 DMU’s (Diesel Multiple Units) were purchased because the original Bombardier BR643 Talent DMU’s used were now not in production, so when service on the line needed to be expanded new vehicles were required. These types of DMU’s have the motor gearing that allows LRT like acceleration not standard commuter railway vehicle acceleration rates, which makes LRT like operation possible and thus allows stations to be much closer together than would be possible on a standard commuter rail line. Standard Light Rail Vehicle or LRV acceleration is faster than the standard Commuter Railway vehicle acceleration rates and thus allows stations to be much closer together which is ideal in suburban and especially dense urban areas. Note that the vehicles I advocated for, the British Class 700 and 345, while similar to the light rail vehicles in many respects (size, weight, speed), are also mainline rail vehicles. Note that one of them is also built by Bombarder, and that both support automation as built (any rail vehicle supports automation, you just have to equip the necessary signalling system etc.). I’d advocate using these vehicles for the REM, operating them just like LRVs. But since they are mainline vehicles, they should be able to intermingle with the AMT and VIA trains. Oh yes, the Alstom Coradia Lint 41 DMU weighs in between 12.56-14.09 per axle load and could be run on your new bridge as well as the Talent BR 643 DMU’s we use to run.